The 3 LED High Power Solar Security Light is a robust industrial grade solar light that kicks out a seriously bright light with a super long detection range to match. Both light and PIR (Passive Infra Red) can be angled easily to give you maximum control. Unlike many other solar security lights on the market, it''s powerful 6V / 3.2AH rechargeable battery enables it to operate for longer than rival solar security lights making it ideal for our variable weather conditions. 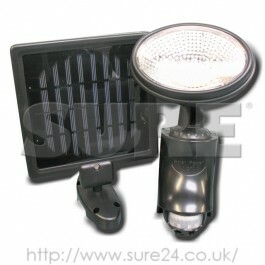 Solar security lights can be placed anywhere outside allowing you the freedom to light any area without needing to call an electrician to install a costly outdoor mains power supply.